Its a Jungle in here! DVF- eat your heart out- I have a wrap dress with major animal appeal from our girl at Wonderfully Made! I love her styling on this one! Katie, you are giving us all a run for our money- this is leopard-lovely and the boots…I sigh! This weekend on Pattern Review I saw this gorgeous Vogue 1270 on Erin and knew that you must see it too! Welcome to the jungle Erin! Now I’ve heard the snickering and the whispering of ‘can’t attend her own party? What is she Jay Gatsby? !’ Lord, I love how literary sewists are- there’s nothing like a Great Gatsby burn, right? Well, here I am in Vogue 8681….ooh sepia! No Fair! Why does she get 2 pictures? Cuz it’s MY BLOG!!! I’m thinking about more fabric shopping in this picture…and James Mcavoy is pushing my cart…. Look, look deep inside Karin‘s tote bag! It’s ready to pounce! What a great Mom to make this fabulous bag! Are you familiar with Eyelash Fur? It’s usually what follows a sloppy dachshund kiss…no, it’s better! 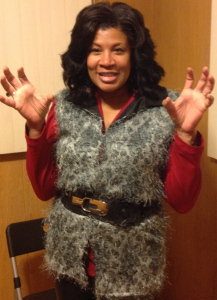 Check out Norie and her gorgeous vest! Velo, do you leave the house except to find more enviable prints? I’m smitten with your style this month (and last month, truth be told)…. 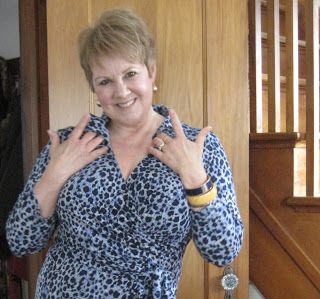 Macstabby is quite retro-tastic in her cheetah bow belt- I love it with yellow, don’t you? More gorgeous piccies! LOVE you in that dress – you saucy thing! Im in very daunting company, arent I? The fun continues on! Such creativity!! You are on the ball! Loving that dress and it is lovely with the magenta shrug. Gorgeous! Grrrrr! I think it needed some contrast! Love that dress. It’s so your style. Congratulations on making it. Everyone’s been having fun with this challenge. Thanks so much. Oh, I had no idea so many would be willing to play! Im really enjoying this! Well, I have big cat coloring! Awesome job, jungle cats! Love what you’ve all done with jungle prints – it’s fabulous! So many more adorable jungle creations! Love your new dress. 🙂 And I may just have to “borrow” that idea from Macstabby for an animal print belt – so cute! Im sure she wouldnt mind! this is so fun! and all gorgeous makes! I totally missed out on it! But great idea and it really has caused a stir! everyone is loving the animal prints! I keep checking on you! Love that ….no, its a surprise! Your dress is just great! The creativity and talents of each and everyone sharing in your Jungle January have just blown me away. Thanks for perking up January for many!! We’re having fun! You know I wore it to work and eyebrows did raise! ….I thought I heard the sound of jaws dropping!! 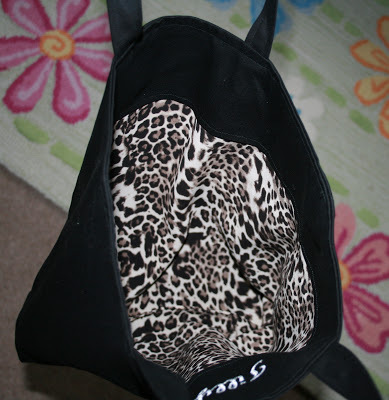 Oh gee, thanks for featuring my bag! I feel kind of embarrassed compared to the other creations, but still tickled pink to be included! 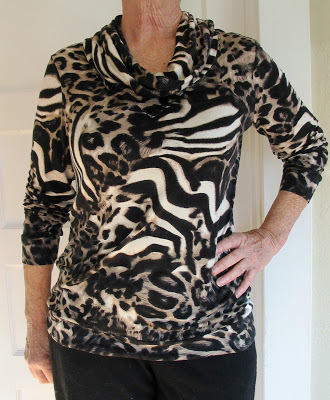 I want to see animal print incorporated in all style aspects- you have it! I can’t stand it any more! 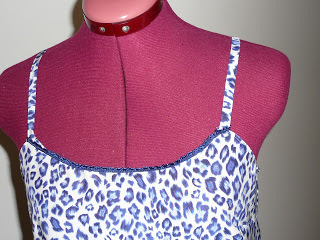 I’m going up to my sewing room to cut something out of a jungle print! I am so envious of all this loveliness!!! Give in to the big kitties and zebras and snakes! Love your dress! I’m almost done – All I’ve got left to do is the hemming (and hawing)! Oh yay! I can haw like nobodys business myself! Why thank you- thats how I hide in the upholstry section! Simply divine with the purple accents. Love. How you manage to kick that jungle dress up a notch with a purple bolero…sheer magic! So much awesome Jungle January-ness up in here! Including your awesome new dress. 😉 So much inspiration to be had! 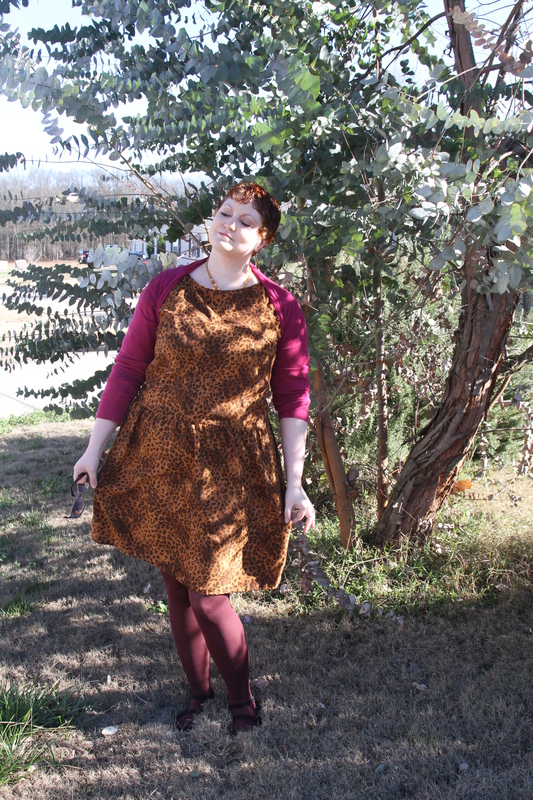 The sepia jungle dress is a winner. I wouldn’t have picked the colour for you, but its so flattering to your colouring, both with the toning accessories and the purple. This is the most beautiful jungle ever!! Thanks for encouraging all of this gorgeousness. Yet another great parade!! Love your dress! Oooooh, some more good ones this round! I have to say I love your leopard print dress and the way you paired it with the fuchsia sweater and tights! Animal Print + Pink = Always the Correct Answer 🙂 (Still working on mine, only some embellishing to go). I may have a fail on my hands…my Cynthia Rowley feels dated. Hmm, I don’t think so. It’s quite classic. What about a bright fuchsia or emerald belt with it? (not too wide). Would mod things up. 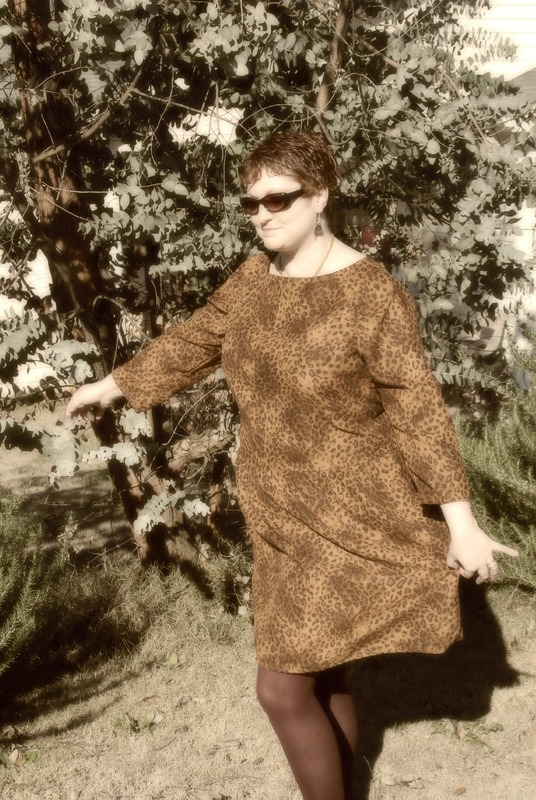 Oh I was referring to my inprogress animal print dress- its feeling Dynasty! I’ve been enjoying seeing everyone’s jungle creations, so I’m joining in!!! Oh love a bit of leopard – Erin’s dress is gorgeous too. I was so pleased to spot her on Pattern Review! Ack. Now I want blue leopard. You’re a terrible enabler. Or an excellent one, depending on your point of view. And I love your own styling, I was wearing pink cardi with leopard skirt a couple of days ago!